There’s no city in the world like Vegas! Find out what makes this place so special on this fun, flexible Big Bus Premium 2 -day hop-on, hop-off bus tour. Relax on-board an open-top double-decker bus with 360 degree views. As you travel along, a knowledgeable guide will keep you entertained with fascinating stories. View the city’s most iconic landmarks including the legendary hotels and casinos, Miracle Mile, the malls, museums and monuments, the 'Welcome to Las Vegas' sign, the Golden Nugget, Fremont Street and much more. Explore the city at your own pace on three great routes; hop off at any one of the 15+ stops to shop, eat, visit attractions and rejoin when you are ready. You can leave the hop-on hop-off bus tour at any of the stops. 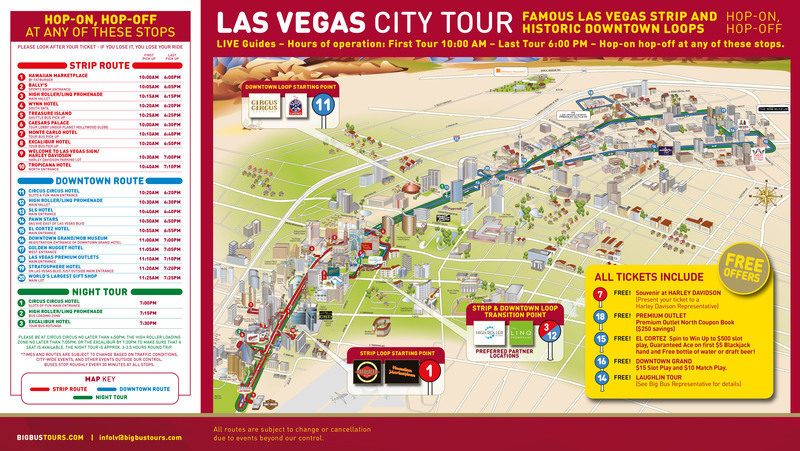 The Big Bus Tours - Las Vegas 2 day Premium Hop-On Hop-Off Bus Tour showcases all the unmissable Las Vegas sights. You will travel on a comfortable double-decker bus with panoramic views. Buses depart frequently during the day and your ticket entitles you to unlimited travel on two great routes – Strip Route and Downtown Route, between the operating hours of 10:00am to 6:00pm. There are more than 15 convenient stops close to main attractions. You can leave and re-board the bus as often as you want during the day, or remain onboard for the full route if you wish. An expert guide will provide an informative and amusing commentary while you are onboard the double-decker.